^ NS-Archiv, 7 April 1925. ^ Debunking Denial : Hitler's Orders. Emory University. [2016-10-13]. ^ Dieter Schenk, Frank: Hitlers Kronjurist und General-Gouverneur, 2006, p.65. ISBN 978-3-10-073562-1: "Dass Adolf Hitler bestimmt kein Judenblut in den Adern hatte, scheint mir aus seiner ganzen Art dermaßen eklatant bewiesen, dass es keines weiteren Wortes bedarf,"（p.330 of Frank's memoirs published in 1953 as Im Angesicht des Galgens. Deutung Hitlers und seiner Zeit aufgrund eigener Erlebnisse und Erkenntnisse）. ^ 王志强. 《第三帝国崛起》. 外文出版社. 2010: 第3页–4页. ISBN 978-7-119-06241-9. ^ United States Holocaust Memorial Museum. Adolf Hitler: Early Years, 1889–1913. www.ushmm.org. [2018-01-15] （英语）. ^ Sterneckerbräu, München. Historisches Lexikon Bayerns. ^ See Verbotzeit for details. ^ Downing, David. The Nazi Death Camps. World Almanac Library of the Holocaust. Gareth Stevens. 2005: 33. ISBN 0836859472. ^ Emmerson, J.T. The Rhineland Crisis , Ames: Iowa State University Press, 1977 pp. 72–4. ^ Kershaw, Ian Hitler Hubris, New York: Norton, 1998, 1999 pp. 582–86. ^ 1938: Austria. MSN Encarta. [2007-03-11]. （原始内容存档于2009-10-31）. ^ Mayerhofer. Österreichs Weg zum Anschluss im März 1938. Wiener Zeitung Online. 1998 [2007-03-11] （德语）. 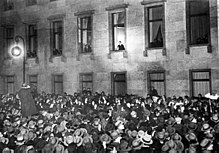 Detailed article the on the events of the Anschluss, in German. ^ Elbing-Königsberg Autobahn. Euronet.nl. [2009-01-11]. （原始内容存档于2007-09-27）. ^ The Avalon Project : Documents in Law, History and Diplomacy. Yale.edu. [2009-01-11]. ^ 改變歷史的13分鐘 希特勒死裡逃生. 風傳媒. 2015-02-06 [2015-02-06] （中文（繁體）‎）. ^  CNN: KGB chief ordered Hitler's remains destroyed. ^ 研究證希特拉死於1945年 推測雙料自殺亡. 都市日報. 2018-05-20 [2018-05-21]. Hant, Claus. Young Hitler. Quartet Books. 2010. ISBN 978-0704371828. Shirer, William L. The Rise and Fall of the Third Reich. Simon & Schuster. 1990. ISBN 0-671-72868-7. Bloch, Michael. Ribbentrop. New York: Crown Publishing. 1992. Bullock, A. Hitler: A Study in Tyranny. Penguin Books. 1962. ISBN 0140135642. Butler, Ewan; Young, Gordon. The Life and Death of Hermann Goering. David & Charles. 1989. ISBN 071539455X. Carr, William. Arms, Autarky and Aggression. London: Edward Arnold. 1972. ISBN 9780713156683. Conway, John S. The Nazi Persecution of the Churches 1933–45. 1968. Cornish, Kimberley. The Jew of Linz: Hitler, Wittgenstein and their secret battle for the mind. 1999. Crozier, Andrew. Appeasement and Germany's Last Bid for Colonies. London: Macmillan Press. 1988. ISBN 0312015461. Dawidowicz, Lucy. A Holocaust Reader. New York: Behrman House. 1976. Dawidowicz, Lucy. The War Against the Jews. Bantam Books. 1986. Doerr, Paul. British Foreign Policy. Manchester: Manchester University Press. 1998. Dollinger, Hans. The Decline and Fall of Nazi Germany and Imperial Japan. Gramercy. 1995-03-28. ISBN 0517123991. Fest, Joachim C. The Face Of The Third Reich. London: Weidenfeld & Nicolson. 1970. Fest, Joachim C. Hitler. New York: Harcourt Trade Publishers. 1974. Haffner, Sebastian. The Meaning of Hitler. Harvard University Press. 1979. Hakim, Joy. A History of Us: War, Peace and all that Jazz. New York: Oxford University Press. 1995. ISBN 0-19-509514-6. Halperin, S. William. Germany Tried Democracy: A Political History of the Reich from 1918 to 1933. The Norton Library. 1965 . ISBN 0-393-00280-2. Hamann, Brigitte; Thornton, Thomas. Hitler's Vienna. A dictator's apprenticeship. Oxford University Press. 1999. Hildebrand, Klaus. The Foreign Policy of the Third Reich. London: Batsford. 1973. Kee, Robert. Munich. London: Hamish Hamilton. 1988. Keegan, John. The Mask of Command: A Study of Generalship. Pimlico (Random House). 1987. Keegan, John. The Second World War. Glenfield, New Zealand: Hutchinson. 1989. Kershaw, Ian. Hitler: 1889–1936: Hubris. New York: W. W. Norton & Company. 1999. Kershaw, Ian. The Nazi Dictatorship: Problems and Perspectives of Interpretation 4th. London: Arnold. 2000a. Kershaw, Ian. Hitler, 1936–1945: Nemesis. New York; London: W. W. Norton & Company. 2000b. Langer, Walter C. The Mind of Adolf Hitler. New York: Basic Books. 1972. Lewis, David. The Man who invented Hitler. Hodder Headline. 2003. ISBN 0-7553-1148-5. Marrus, Michael. The Holocaust in History. Toronto: Key Porter. 2000. Murray, Williamson. The Change in the European Balance of Power. Princeton: Princeton University Press. 1984. Overy, Richard. The Dictators: Hitler's Germany, Stalin's Russia. Penguin Books. 2005. ISBN 0393020304. Payne, Robert. The Life and Death of Adolf Hitler. New York, New York: Hippocrene Books. 1990. ISBN 0880294027. Rees, Laurence. The Nazis: A Warning From History. New York: New Press. 1997. Rißmann, Michael. Hitlers Gott. Vorsehungsglaube und Sendungsbewußtsein des deutschen Diktators. Zürich München: Pendo. 2001. ISBN 3-85842-421-8 （德语）. Roberts, Andrew. The Holy Fox. London: Weidenfeld and Nicolson. 1991. 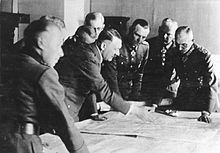 Robertson, E.M. Hitler's Pre-War Policy and Military Plans. London: Longmans. 1963. Röpke, Wilhelm. The Solution to the German Problem. G. P. Putnam's Sons. 1946. Rosenbaum, R. Explaining Hitler: The Search for the Origins of his Evil. Macmillan Publishers. 1998. ISBN 006095339X. Speer, Albert. Inside the Third Reich. Weidenfeld & Nicolson History. 2003. ISBN 1-842-127357. Steigmann-Gall, Richard. The Holy Reich: Nazi Conceptions of Christianity, 1919–1945. Cambridge; New York: Cambridge University Press. 2003. ISBN 0521823714. doi:10.2277/0521823714. Strobl, Gerwin. The Germanic Isle. Cambridge, United Kingdom: Cambridge University Press. 2000. Tooze, Adam. The Wages of Destruction. New York: Viking Press. 2006. Waite, Robert G. L. The Psychopathic God: Adolf Hitler. Da Capo Press. 1993. ISBN 0-306-80514-6. Weinberg, Gerhard. 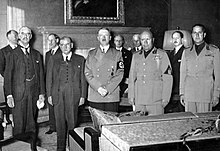 The Foreign Policy of Hitler's Germany Diplomatic Revolution in Europe 1933–1936. Chicago, Illinois: University of Chicago Press. 1970. ISBN 0226885097. Weinberg, Gerhard. The Foreign Policy of Hitler's Germany Starting World War II. Chicago, Illinois: University of Chicago Press. 1980. ISBN 0226885119. Wheeler-Bennett, John. The Nemesis of Power. London: Macmillan. 1967.